For most people, the phrase “mission impossible” is most closely associated with a series of movies starring Tom Cruise. But for anyone who’s tried to bridge the divide between various levels of government in this country, much less tried to unite them behind a common cause, it’s one that could apply just as well to their work. And when it comes to getting them to fund said project, well, those same people would probably sooner take their chances parachuting out of an airplane or trying to jump from a motorcycle onto the back of a moving car. But the people behind the Okanagan Basin Water Supply and Demand Project, which was created in 2006 in order to measure current and future water needs in the Okanagan valley, managed to fulfill their mission—and then some. 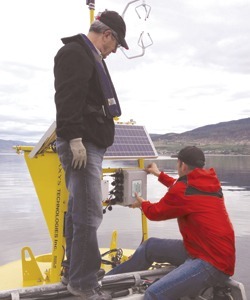 The project, which was jointly funded by the Okanagan Basin Water Board, the British Columbia Ministry of Environment, Agriculture and Agri-Food Canada and a variety of other government initiatives and funding mechanisms (not to mention the dozens of scientists, researchers and community leaders who contributed their time and effort) was an unqualified success. As a result, members of both the private and public sectors in the Okanagan now have a valuable resource that will help them plan and manage the region’s scarce supply of fresh water going forward. Denise Neilsen, a research scientist with Agriculture and Agri-Foods Canada and a participant in the Okanagan Basin Water Supply and Demand Project since day one, says that the catastrophic drought that hit the region in 2003 galvanized people into thinking more seriously about water security. The Okanagan Basin Water Supply and Demand Project was an attempt to respond to those concerns—and equip them with the information they needed to do something about them. That information, and the many different ways in which it can be used, has already had a major influence on water policy in British Columbia and beyond. The data itself is being used in everything from dam safety studies and hydrology research to water master plans and regional growth strategies in the Okanagan, and has been so useful to local planners, scientists and government officials that those in other parts of the province (from the nearby Similkameen to Vancouver Island) have begun to deploy similar techniques in order to better understand their own watersheds.